Update: The "Zone: 0.1" update. Massive visual overhaul, Sonic CD section added with Background Info and Palmtree Panic pages. New notes feature, new link submission feature, new downloads and much more! After a lengthy redesign process of about 9 months, I am thrilled to say that the new look Zone: 0 is here! Not just a new look in fact but really, a full blown site launch. Of course we've been kicking around online for nearly two years now, but in all that time it was really only supposed to be a "pre-release", built on a very temporary visual design. As such, I've used that time to test the waters, see how the site structuring works and what you guys liked and wanted to see more of. As a result, what you see before you is pretty much a complete rebuild from the ground up. I don't think any piece of code from the old site has really remained. What I wanted instead was something that looked good, essentially. Something that reflected my passion for the series and the writings I've created. Level pages should continue to look even more personalised and I wanted to really go all out with the overall design, have it flowing with effort and something approaching perfection. Something few of us, least of all me, can ever achieve, but as I often do, I've strived to get of it what I can. The original look was thrown together with my then more limited knowledge of CSS, PHP and whatnot - I was eager to get my game guides live and the overall packaging was less important. I've kept the basic content structuring because I feel that works, but I've tried to pack in much more visual flair in every nook and cranny I can find. I hope you like it. It's taken me far too long, I admit, but it's here now and I hope it makes your experience here more enjoyable. Sonic CD! - At last. In the new Sonic CD section you will find Palmtree Panic, plus the Background Information page and the beginnings of the Stages and Story page. I'm afraid I have not been able to add the maps to the level in time for this update, which is unfortunate as I really wanted to pay tribute to the work Mercury has done on his map extractor utilities, without which Sonic CD maps are far too numerous for me to possibly make them in any significant detail. I didn't want to delay the update any further either, but the additional work still involved in identifying routes and ideal time travel locations was too much to fit in this weekend and I didn't want to rush it for fear of missing anything. They should be up within the next week or so. New Notes feature replaces Page Replies - As opposed to keeping my content and your comments separate, you now have the ability to add your own notes to each individual section of a page. Submitted notes and entry fields open up in the page, just underneath the content, all in the aid of sharing information that is more accessible and relevant. User Links - To the right of each page, there's an additional little box you can use to post up a relevant link to another page. These can be to things like speed runs through a level on Youtube, or perhaps someone's created a particularly snazzy artwork inspired by a level, an interesting tidbit of information - whatever you like really, within reason and relevance of course. New downloads - Sonic's 1 and 2 now have a new Downloads page, where all of the files are dumped together in a handy one-stop-shop. You'll also notice new downloads in the form of music, art and manual scans. Lightbox-powered full sized pics - Again, time restraints prevented me from fully implementing this feature throughout the site, but you'll see it on the Background Info pages and just Green Hill at the moment, as a sample. You'll be able to click on most images to reveal them full-sized and uncropped in an opening lightbox that appears on the page. New image caption boxes - Over the years, captions that I've added to the images have got more and more detailed to the point where I now write them to aid skim-reading. Simply roll over an image to get the gist of what's going on, without needing to dive into the full text. With this in mind, I've improved the caption functionality with a specially designed caption box that appears over the images, as opposed to relying on the tooltips provided by browsers, which vary greatly. IE and Safari users, I may still need to tweak this in order that you don't end up with both. Improved image compression - Screenshots are now in super-compressed PNG format, using PNGOUT, as opposed to gif. They're round about 50% lighter in file size, leading to pages that load in about half the time, but at no loss in quality! Sadly I could not get the maps down to a significant reduction without a loss in quality, so they remain. Thanks to Reckoner for the advice on that. - Green Hill Zone Misc section has had things added. - Scrap Brain Zone has had that much needed update to the hidden path along the top of Act 2. - iPod info added to the Sonic 1 Misc section, under Ports. - Various map updates including Chemical Plant, Scrap Brain, Oil Ocean and Labyrinth. All underwater areas are now properly coloured in their underwater palettes. - Also, a long time ago, Flint kindly wrote some better descriptions of the Sonic 1 music tracks that I've been meaning to add ever since. I wanted to do something clever with them, but turns out they were better off just slotted in as normal, which I could have done anyway. They're now included - sorry for the long wait Flint! So, if you've been following the site for a while, hopefully the new look and all the new features impress. I'm quite proud of it, this full rebuild has been my biggest and longest programming project yet, including a very clever new admin system which unfortunately you won't get to see, but trust me, it's a beaut'! On this side though, I am quite pleased with the level pages in particular, which is where most of my design attention has gone. Though all the information is drawn from databases into a single page, I really wanted to keep each level looking individual, with its own colour scheme and layouts that burst out of the page. I also do like this silhouetted banner and side designs of a big conglomerated level - "Zone 0", if you like. It's one of the first things I made and over time I've had other ideas for it, but I have to trust myself that I was impressed when I first finished it! I'm pretty sure that there is something in there, object or piece of scenery, from every level in Sonic 1, 2, 3, &K and CD. If you're looking for a challenge, try and spot them all! But as I've said a few times, there were things that I couldn't quite finish in time that I really wanted to do, but I couldn't push the deadline back any further and so, my work is not yet complete! I'll be adding things one by one over the next two or three weeks to bring it up to where I wanted it, and I'll keep you up to date on those. But for now.. I need a rest..
Mercury for his excellent map extraction tools that are sure to save me hours of hard work. Reckoner for diligently reading through my guides and highlighting errors, most of which have now been addressed. Flint for providing me with far better descriptions of the Sonic 1 music tracks. Everyone who's posted a comment about how my guides have helped you. Every time I read one it makes all the hundreds of hours of work worth it. Mercury for not getting his map work up in time! Flint for taking FAR to long to get his descriptions online. EVERYONE, for taking far too long with this redesign and only just getting round to Sonic CD! Oh well, now we can press on with the good work. Welcome to Zone: 0. The Comprehensive Sonic the Hedgehog Game Guide. Comments 9 Comments have been posted. Wow, I LOVE the new visual design overhaul! The background is a great artistic touch, and I haven't even got off the main page yet, but I will do. I never actually played Sonic CD [what? I already had a Megadrive and SNES! ], so I'll be looking through that section shortly. So my first sightings of Amy and Metal Sonic were in the UK Sonic comic [STC] and game-wise in SA1 [in the containment tubes]. So it'll be coolio to see Metal Sonic's first appearance finally [even if STC did loosely adapt it]. But have a big pat on the back from me for the continued dedication to this site, though, goodness knows how long it takes to analysis every stage and then write about it and then all the extra noggins and everything else, making sure all the links work correctly etc. I look forward to its continued progress and success. Amazing... my hat's off to you for the new design. I absolutely love the new background picture with all the zone elements (now we know what took so long ;P)! No sweat about the late-in-coming maps, either - I know how it feels to be overworked! It's really great!!!!!!!!! Very well done!!! Amazing!!!!!!!! It's wonderful!!!!!!!!!!!! I'm really overwhelmed and speechless!!!!! Thanks very much guys, I'm so glad you like it! Been a hell of a lot of work, but now I can finally rest!.. a bit. Well Done! I love the new download section on the individual games! All your work paid off. I suppose Sonic CD will be a lot of work Good Luck! I personally can't wait until you get to Sonic 3 and Knuckles! Oh wow, this widdle site is aww gwown up! *sniffs* I'm so happy. Great job, the site looks awesome. Dude. I absolutely love what you have done with the layout of this entire site. I love the references to Sonic 1, 2, 3, Cd, and Knuckles. You even threw in stuff from the Sonic Advance Games. 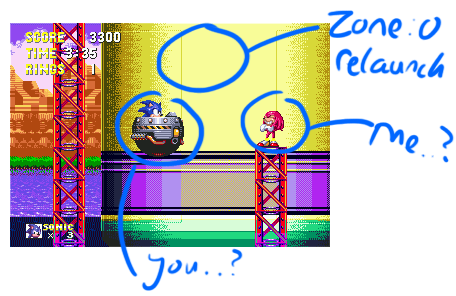 There's hoops and rails, two things from the second Sonic Advance. Great and beautiful wrk. I also like the fact that the designs overlap. That means you get two very sweet images at once. I hope Zone:0 is a very sucessful Zone: 0.1. Keep up the terific work. I AM -THIS- CLOSE TO LAUNCHING THE BRAND NEW REDESIGN..
..Hopefully you're not as eager to stop the relaunch of Zone: 0 as Sonic is there in stopping the relaunch of the Death Egg, but you get the idea. "ZONE: 0.1"... COMING SUNDAY 22nd FEBRUARY. Awesome site, good job TSS adevertised it. Well, I did say I would aim to have the new look Zone: 0 up online by about this time, and clearly, it isn't. Sorry, I had a feeling it would be a bit of a push. Compared to all the large tasks I've already been doing on it over the last half a year, there's literally only a few odds and ends to sort out, but if you work with websites and anything like this, you'll know how much longer any given thing tends to take compared to what you logically expect, especially if you can only do it in your free time. I'll try my best to get it out the door some point within this month and I'll post up a few days in advance when to expect its "release date". I've a big weekend ahead of me on the site, and I'm determined not to waste it, so that'll be all on this occasion. Check back soon though! Okay, this is probably a silly question, but, are you a fan of Stephen Fry? The man is hilarious, I'll watch just about anything with him in it. I'm particularly fond of Blackadder series 4, QI, and Jeeves and Wooster. It's his brand of comedy that tickles me the most, and in the Sonic project I'm working on (since it's supposed to be so heavily focused on story), I give special attention to being as funny as I can, but of course without degrading the integrity of the characters. I remember some good old RPG's, like Wasteland, Phantasy Star IV, or Chrono Trigger, with exceptionally well written humour, but without being outright comedies, and this is something I think is highly important in games. If you're laughing, you're having a good time. Not to go the well-trodden road of knocking modern Sonic Team, but Sonic the Werehog landing on top of Chip isn't my idea of great comedic genius. Oh well, time will tell if I can do any better. Anyway, I just thought it was interesting, because Sonic the Hedgehog and Stephen Fry aren't two things I'd ever have expected to see mentioned on the same page, even though they're both indelibly part of my personal culture. Well, now I gotta get back to drawing sprites (I'm going for an animated film look - go figure). Good luck with the site, and all future updates! Absolutely, who isn't a fan of Stephen Fry? I love his wit and the fact that he seems to know everything about everything. I'm following him on Twitter and it's a bit surreal that he's posting online updates regularly.. just like a normal person! It's amazing how he fits that in, along with all the other projects he has to do. I agree, Sonic game storylines should never take themselves too seriously. Even if their wit isn't the finest it's nice to see it present when it does appear. A bit of humour in anything is rarely a bad thing, in my opinion. Good luck with capturing a few laughs in your game. Any idea when we might be able to see a demo or anything on it, or is it too early to say? I'd be very interested.